Watsonian Sidecars helped the Women’s Institute to celebrate its centenary , providing transport for their local WI to carry a specially commissioned baton in a national relay. Moreton-in-Marsh WI arrived in a fire engine and handed the baton to former president of Blockley WI Sheila Weir, who delivered it to the neighbouring village of Ebrington in a Royal Enfield/Watsonian Manx outfit, driven by company director Ben Matthews. 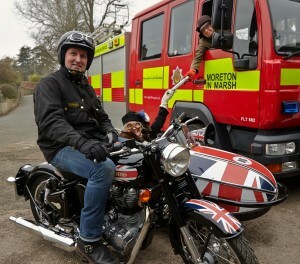 It was her first trip in a sidecar and she thoroughly enjoyed the experience. Blockley Village Shop baked a cake to celebrate the occasion, decorated with a miniature version of the sidecar combination.